The U.S. cannabis industry is projected to exceed $50 billion by 2026, according to Cowen & Co. analysts, driven by the legalization of recreational cannabis in states like California and Nevada this year. At the same time, Deloitte analysts expect Canada’s market to surpass C$22.6 billion following the nationwide legalization of recreational marijuana. Investors have many options to capitalize on these trends that they should consider. International Cannabrands Inc. (CSE: JUJU.A) aims to become a leading premium cannabis brand through its license agreement with Julian Marley. In addition to its agreement with Maricann Group Inc., a large licensed producer in Canada, the company aims to build a retail presence in the United States leveraging its brand. International Cannabrands owns the exclusive rights to use Julian Marley’s name and personality for up to 60 years. Over the past year, the company has developed the JuJu Royal brand of ultra premium cannabis products to commercialize those rights. The goal is to build a leading brand presence in the highly fragmented cannabis industry – expected to reach $22.8 billion by 2020 – alongside other brands like Snoop Dogg’s Leafs by Snoop. The company aims to build-out two Julian Marley-branded concept stores to jumpstart its brands and generate near-term revenue for shareholders. Over the past year, the company has acquired key license agreements in California, Colorado, Oregon, Washington, Canada, Western Europe, and Puerto Rico where these locations could be setup to sell its branded cannabis, extracts, vape pens, edibles, and ancillary products. 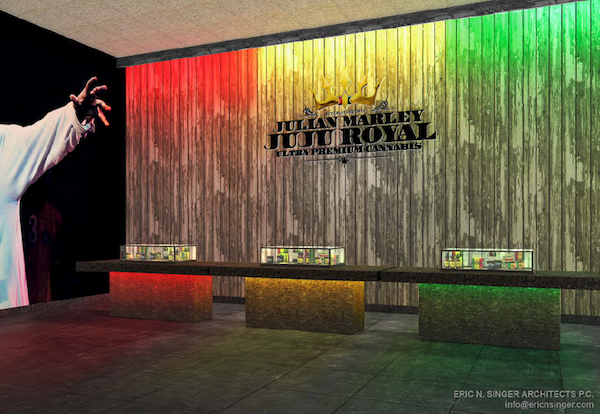 The Julian Marley JUJU ROYAL Ultra Premium Cannabis retail locations are designed to sell all brands of cannabis and related ancillary products in an upscale atmosphere reflecting the lifestyle of its namesake, Julian Marley. 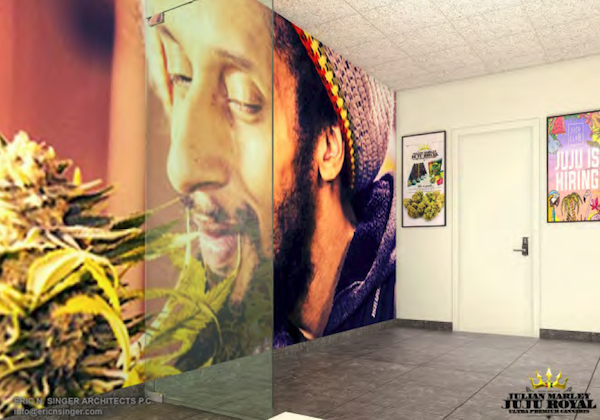 The stores will contain all of the features seen in most retail dispensaries along with some unique features and artwork centered around the reggae movement and Julian Marley as a musician. International Cannabrands’ management team is well positioned to execute on these goals. Chairman and CEO Jeffrey Britz has a proven track record of building startups into large public and private companies, including building a small family fabric business into a $50 million per year business with 2,000 employees. President and COO Travis Belcher has cannabis industry experience as an expert in cultivation, and is very knowledgeable about cannabis genetics and concentrates. 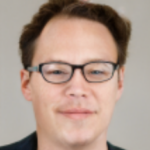 He is responsible for selecting experienced and quality-driven licensees and processors. The company also recently announced the addition of Eric Singer to spearhead its efforts to license and roll out brand concept stores under the Julian Marley name. With years of experience in the retail and food industries, Mr. Singer is well-equipped to handle everything from leasing and architectural design to construction and marketing. He has worked in the past with leading companies like Autodesk, BurgerFi, and Quiksilver. The management team is rounded out by VP of Business Development, Steve Morris, Director of Operations, Jennifer Taylor, and CFO, Mark Scott, who all have tremendous experience in the cannabis industry and related sectors. International Cannabrands Inc. (CSE: JUJU.A) represents a compelling opportunity within the burgeoning cannabis industry. With a strong management team and brand name, the company is well positioned to build out a retail presence and ultimately capitalize on the growing retail market with both operational retail stores and a leading licensable brand. Investors may want to take a closer look at the stock as part of a diversified portfolio. For more information, visit the company’s website at https://intlcannabrands.com/ or download their investor presentation.